According Profile 2018, foreign sources spent $274 million on fictional English-language Canadian television production, compared with only $46 million from private broadcasters, $114 million from public broadcasters, and $100 million from the CMF. While there are concerns about children’s and youth programming, the data tells a similar story: $80 million from foreign sources compared to $26 million from private broadcasters, $18 million from public broadcasters, and $21 million from the CMF. In other words, the unregulated, market-based approach is delivering far more investment into Canadian production than the regulated sector. It is difficult to overstate the shift in funding in Canada. 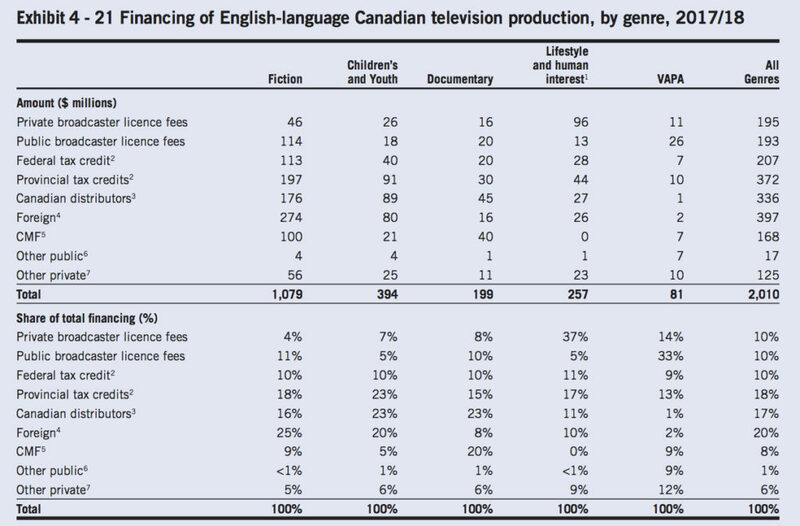 Five years ago, the breakdown of financing of Canadian English language fictional programming involved roughly even split among private, public, and foreign financing with CMF the largest of the four sources. Since that time, foreign financing has grown from $131 million to $274 million, public broadcaster funding has remained largely unchanged ($116 million to $114 million) while the other two have declined significantly: private broadcaster from $115 million to $46 million and CMF from $167 million to $100 million. 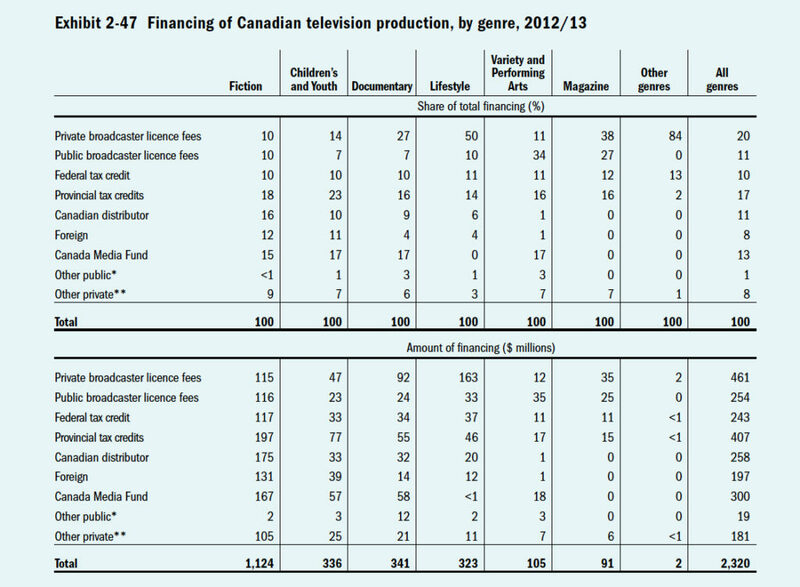 Foreign financing has actually made up for the entire decline in funding from all three other sources, making it difficult to understand the basis for blaming Netflix for Canadian production spending. Canadian producers of English-language Canadian drama are once again seeking foreign participation in their financial structures and so much the better. Twenty years ago, in 1998-99, long before the advent of digital television programming services such as Netflix, foreign financing accounted for 28% of all Canadian production financing (see Exhibit 16 of the CFTPA’s 2004 Profile). Unfortunately, at that time, the published data was not disaggregated any further. Contrary to what Michael Geist asserts, there is no indication in the CMPA’s 2018 Profile of the extent to which Netflix is responsible for the foreign contribution to current Canadian production financing. Most of Netflix’s spending on Canadian production is probably location shooting in Canada on US television series, but since Netflix doesn’t publish any detailed information on what it is doing here, we don’t really know. Hopefully, Canadian Heritage and the CRTC will move to correct this information deficit with appropriate legislation and regulations. This might seem an stretch .. however, when we see the Canadian economy in stormy times such as they are. I believe the CRTC is causing huge ignorant waves in the industry, it makes me wonder just whom is on the CRTC board. Lets look at the History … Is it NOT enough that the CRTC gave cable companies the right to force people to PAY high prices for Cable, then force the clients to watch commercial after commercial in which the Cable companies made money from producing these commercials then selling 15 to 30 second spots? The CRTC and the Cable companies are hand in hand. Then the CRTC allowed these same cable company’s to sell internet starting off at $10 that’s ten dollars a month .. Now its up to the Cable Rates? I understand and have my telecom degree … Thus I have to remind you many of these providers were already in telecom communication company’s which charge their clients for Name and Number display and much more for years and years .. Many of you did not understand or know that the Hardware came with ALL of these features for FREE to the telecom industry .. it was just the “answering hardware” that had an extra cost to the telecom industry .. yet you had to pay for all these features. CRTC just stood by and allowed Canadians to be debut. Now do you think they are not a part of this problem? THINK .. now Think at the beginning all of these providers gave you internet and provided unlimited excess .. This is why NETFLIX has taken so many people away from these types of marketing rings. IT WOKE US UP … and then these providers stated they had to charge you more for access because there were to many clients and the infrastructure need to be upgraded. … PEOPLE wake up .. is an scam. The Hardware is extremely CHEAP and yet again the CRTC is ALLOWING the industry to screw you. Throttling down your connections causing problems with NETFLIX and others .. thus forcing you to pay more for a connection that is already apart of the HARDWARE .. HUGE MONEY GRAB … Thus the CRTC HATES NETFLIX and is protecting the unethical practices of these providers … pretty simple … the secret is out, now get with the times and stop ripping CANADIANS OFF!!!! WE are the most expensive country in the World for ALL communications because the CRTC and the CANADIAN government allows it to happen ! Just look at your cell phone charges .. now think about the kick backs the telecom industry get on all the apps the providers put on your phone .. omg WHEN are Canadians going to stand up?? Look at the USA .. there rates are? Now look at all the EU countrys .. small country’s smaller than Canada and their rates are? The CRTC and the CANADIAN government needs to help Canadians instead of helping the industry to rip Canadians off. .. I could go on about the industry giving Canadian jobs out to third world countrys so there bottom line keeps growing .. when is it going to stop?